The vessel is 107 meters (350 feet) long, has a breadth of 17.6 meters (58 feet) and equipped with two main engines of in total 4,200kW, generating a speed of 15 knots. HONDIUS offers accommodations for in total 180 passengers in 1 spacious Hondius suite (cabin size 33 m2), 6 suites with balcony (cabin size: 29 m2), 8 superior cabins with French balcony (cabin size: 22 m2), 19 twin deluxe cabins, (cabin size: 22 m2), 14 twin window cabins (cabin sizes: 14 to 16 m2), 31 twin porthole cabins, 2 triple porthole cabins and 4 quadruple porthole cabins ( the porthole cabin sizes vary from 13 till 16 m2).The passengers´ certificate for HONDIUS is for 196 passengers. 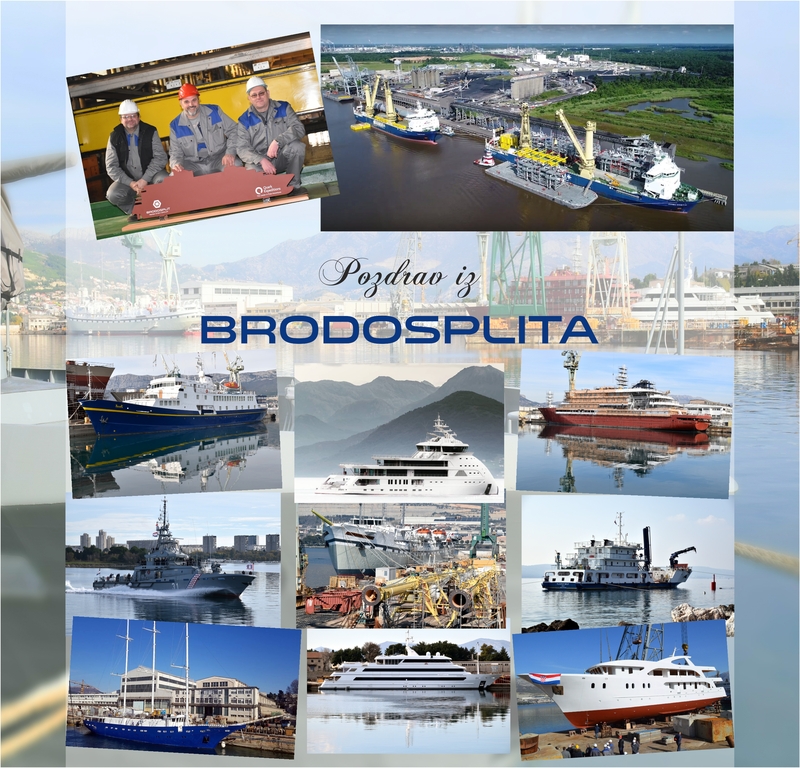 “By signing this agreement, Brodosplit is strongly progressing in the realization of its business plans and is determining its position as an inevitable European shipbuilding system that builds highly complex vessels which achieve high competitiveness. The emphasis in this shipbuilding market is the added value for the Client and also for the Builder which is the basis for successful business.” – said Tomislav Debeljak, CEO of the Brodosplit Shipyard. Vessel’s reliability and safety on board are top priorities. HONDIUS will be the first vessel to be built to class “LR PC6”, meeting the latest and highest demands of Lloyd’s Register for “Polar Class 6” vessels, the highest Polar Class notation for ice-strengthened vessels. The vessel will also fully comply with the mandatory requirements of the Polar code, adopted by the International Maritime Organization (IMO), for safe ship operation and the protection of the Polar environment. HONDIUS will be the strongest ice-strengthened vessel in the Polar Regions and will be equipped with stabilizers,and very suitable for advanced, innovative exploratory quality voyages in the Arctic and Antarctic Regions. Oceanwide Expeditions has been the leading company for commercial exploratory passenger cruises in the Arctic and Antarctic Regions since 1996. “We currently sail with our ice-strengthened 116-passenger vessels Plancius and Ortelius and we are experiencing an increasing demand for Polar voyages. The HONDIUS will give us the opportunity to accommodate these travelers, to grow as a company and to offer new innovative products in the Polar Regions”, says Oceanwide Expeditions’ CEO Michel van Gessel. HONDIUS will offer her passengers an advanced hotel standard as well as a variety of cabin categories; from spacious suites and superiors to twin and quadruple cabins. “While traveling with HONDIUS, our current passengers will recognize our distinctive Oceanwide product, offering a pleasant informal atmosphere on board. Our main focus remains in-depth nature and wildlife programs and the related activity based shore activities, a product that has been very much appreciated by our current travelers for many years.”, explains CEO Michel van Gessel. HONDIUS will be built according to the latest requirements of the International Maritime Organization (IMO), in particular concerning the safety of the life at sea (SOLAS) and the prevention of pollution from ships (MARPOL) for passenger vessels. The protection of the environment is of major importance and will be adopted by Oceanwide during the construction of the vessel. The propulsion system consists of two medium speed main engines and one adjustable pitch propeller. The flexible power management (in combination with a shaft generator instead of operating a diesel driven generator) permits the lowest possible fuel consumption and CO2 emission and therefore a minimum possible impact on the environment. Further environmental features include the use of biodegradable lubrication oils; certifiably hazardous-free coating and paint of the vessel; the use of steam for onboard heating; minimal use of electrical heating (for less fuel consumption); LED interior and exterior lighting (reducing power and fuel needs); and waste heat, such as cooling water for the main engines, reused for the production of fresh water. All further existing requirements and restrictions while at sea and in the Polar regions will be strictly followed.